Turner Broadcasting Gallerie International/Tatsunoko Prod. In the mid 1980s, TV networks relegated Battle of the Planets to odd hours of the morning, then finally dispensed with the series altogether. However, once Sandy Frank's syndication license ran out, media mogul Ted Turner saw the potential in this series and G-Force returned to American airwaves... in a slightly different form. In "G-Force, Guardians of Space," five young heroes protect the Earth from the evil alien computor, his gravel-voiced minion Gallactor, and their legions of green-suited terrorists. Gone were the space battles and 7-Zark-7, replaced by a more accurate translation of the original Gatchaman series--violence and all. Episodes previously left out by Sandy Frank as "too risky" were released. Some fans who might have recognized the faces from Battle of the Planets were now confused by the new names. It didn't help that the heroic team was called G-Force in both versions--is this the G-Force with Mark and Jason, or is this the G-Force with Ace Goodheart and Dirk Daring? G-Force went on an initial trial run in 1986, but mysteriously disappeared after three episodes. It wasn't until the 1990s that the show made it onto the Cartoon Network and gained its own fan following. Due to the relaxed television standards of the late 1980s, more of the original violence was left uncut in "G-Force." Episodes were more complete and less chopped up than Battle of the Planets. There are fewer silly excuses used to cover up violent scenes, giving the audience a little credit for intelligence. G-Force fans claim there is better interaction between the characters--especially Ace and Dirk--than there was in Battle of the Planets. And there's no dippy robot narrator. Voice acting was lackluster, especially compared to what had been done in Battle of the Planets. The "descriptive" character names might have worked in the 1960s or in a less dramatic show, but are out of place in this series ("Dr. Brighthead"?). Original background music wasn't included in the original series package to Turner, so a horrible electronic disco backbeat needles the audience like Chinese water torture. We won't even mention the opening theme. In the near future, the world is menaced by a criminal organization known only as the Galactor Syndicate. Led by Berg Katse, who answers to a mysterious entity known as Overlord X, Galactor's monster mechs threathen the International Science Organization's (ISO) plans to create a pollution-free energy source. To combat the menace of Galactor, Dr. Kozaburo Nambu decides that the time has come to bring in the ISO's secret weapon: five bird-garbed youths trained in the ways of the ninja and armed with the most remarkable weaponry science can produce. These five are the Science Ninja Team! 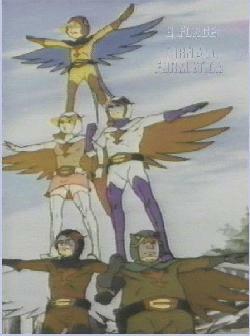 Led by Ken the Eagle (also known as Gatchaman), a bold leader type, the team includes Joe the Condor, a rebel out for revenge against Galactor, Jun the Swan, communications and demolitions expert, Jinpei the Swallow, Jun's adopted kid brother and just as skilled as the others, and Ryu the Horned Owl, a brawny sort who not only is the pilot of the God Phoenix, he is also the only one of the five with living family. Together, these five are the world's only hope against Galactor.